In Part 3, we covered the methods of practicing Vishnu Sahasranamam as ‘Japa’ and ‘Archana’. In this part, we will learn the method of practising it as ‘Parayanam’ or recitation of the whole Stotram. The word ‘Parayanam’ consists of the two words ‘Para’ and ‘Ayanam’. Para means limit or end and Ayanam means journey, So the term Sahasranama Parayanam means navigating to the end of the 1000 names in the Stotram. Generally, Vishnu Sahasranama Parayanam is recited in a single session, in contrast to the Parayanam of extensive works like ‘Srimad Bhagavatham’ or ‘Ramayanam’ which can be spread over several sessions over several days. It is important that Vishnu Sahasranamam Parayanam is chanted with the correct pronunciation and rhythm. If you wish to begin with Parayanam as a means of practicing it for the first time, it would be advisable to seek the guidance of a person who is already adept in its practice. 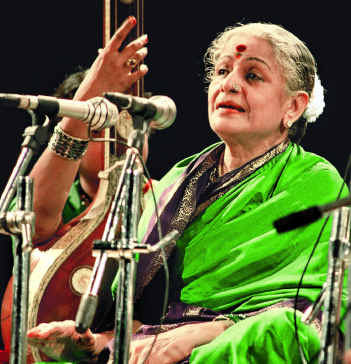 Alternatively, listening to the audio recording of renowned vocalists such as M S Subbulakshmi is a good way to learn the proper pronunciation and rhythm. We will consider each of them below. In this procedure Vishnu Sahasranamam is recited as a daily routine just like taking shower or eating or other activities. There is no expectation of any reward attached with this daily recitation. The purpose of the recitation is mainly for Chitta Shuddhi or for purification of mind. In this process, the ever restless mind is quietened. With the mind kept calm and devoid of agitations, it is easier to pursue the path of spiritual enlightenment. There are no limitations of time, attire, place etc. for Nitya Parayanam. One can do it at any time of the day and in any attire. It can be recited while walking on the road or shopping or using public transport. In this ipod, mp3 and iphone generation, it has become all the more easier to practice this even while at one’s work desk. In short, it is called ‘Yatha Sowkaryam’ or ‘do it at your convenience’. Done regularly as a duty it increases will power and self-esteem. It instils a sense of purpose and discipline in one’s daily life. Kaamya means ‘with a specific wish or desire’. This method of Parayanam refers to a specific pattern of recitation performed to achieve a certain objective or desire. The objective or desire may be for more money, progeny, a job, a promotion, cure for a disease, prosperity and so on. Unlike Nitya Parayanam, Kaamya Parayanam has got a number of procedural restrictions. It has to be performed at a specific time either in the morning after shower or in the evening. It has to be performed for a specific number of days say 48, 24 or 12 days. Each day’s recitation should be done like a Pooja or a prayer with the picture or idol of Vishnu decorated with flowers and completed with Neivedyam (offering) and Aarathi (with camphor). Ideally this should be performed by the person who has the wish or desire that needs to be fulfilled. However, where this is not possible either due to ill-health or for any other reason, such a person can seek the help of an accomplished Parayanam practitioner to perform on his/her behalf. 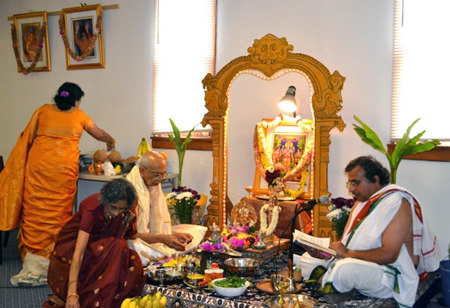 It is important that the person performing the Parayanam is treated with respect and suitably honoured. For more details on Kamya Parayanam please refer to the book ‘Sakala Karyasiddhi tarum Sri Vishnu Sahasranama Stotram written by K Sreenivasacharyar published by LIFCO publications. Samooha Parayanam as the term connotes is a community chanting. 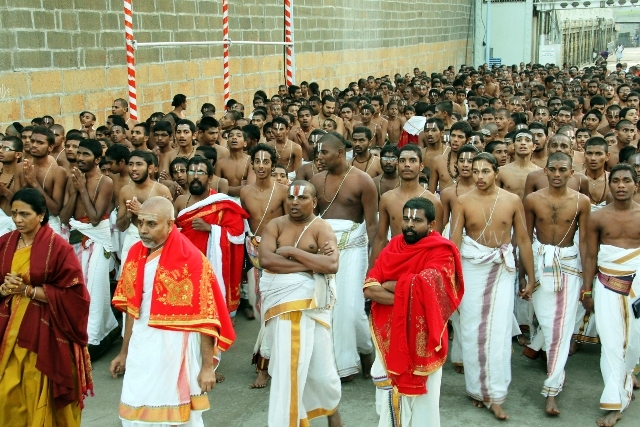 This involves a group of families assembling at a common place and reciting the Sahasranamam together. In most places this is conducted either once a week or once a fortnight or even once a month depending on the Group. 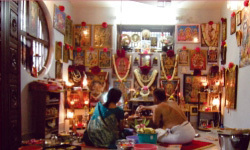 It is increasingly common practice for Vishnu Sahasranamam to be chanted in Satsangs or Groups as Samooha Parayanam which is usually conducted during the weekends. This is the next best alternative for those who are unable to do the Nitya Parayanam. 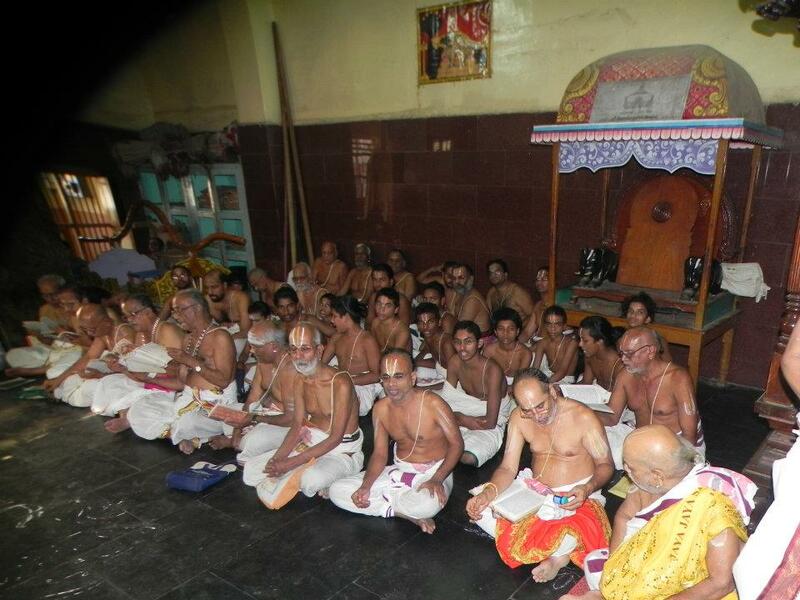 Participation in Samooha Parayanam is a good way to get initiated into the Parayanam of Vishnu Sahsranamam and this can also be a good training ground. Adi Sankara in verse 9 of his Bhaja Govindam song extols the importance of Satsang. An unwavering and steady mind is merited for Jeevan Mukti (liberation even in this life). Vishnu Sahasranamam Groups provide a good opportunity for social and cultural interactions thereby serving spiritual and cultural needs. The purpose of Dhyana Shloka is to visualise a clear image of the Lord in our mind’s eye before we begin worshipping Him with his one thousand Namas. It is pertinent to ask whether we are justified in ascribing a particular form and shape to the Absolute Brahman and putting Him under the limitations of physical coordinates. “Ajaayamaano bahudhaa vijaayate” meaning “Though the Brahman is unborn (and therefore shapeless and formless), He manifests himself in various external forms”. Arjuna has asked this question on our behalf to Lord Krishna, in the first shloka of Chapter 12 in the Bhagavad Gita. Arjuna asks: Who is a better devotee, the one who worships the abstract impersonal formless abstract God (Nirguna), or the one who worships God as a manifested personal idealised idol (Saguna)? Krishna replies: That both forms of worship are equally acceptable to Him and both devotees ultimately reach Him. However, the worship of the abstract and formless God is very difficult for most people to follow. People can associate with finite bodies and cannot easily comprehend the infinite Brahman. They need a defined image and a specific form to concentrate and focus their meditation through objectification. “Just fix your mind upon Me and engage all your intellect in Me. Thus you will reside in Me always, without a doubt”. The Dhyana Shlokas helps the seeker to achieve this state of unison with the God. The mind and the intellect of the reciter are taken out of the material plane and fixed in the form of the Lord. Once the mind is free from agitations and becomes calm it is free to receive the spiritual vibrations from chanting of the Vishnu Sahasranamam. There are seven beautiful Dhyana Shlokas for Vishnu Sahasranamam. They paint a vivid picture of the splendour and grandeur of Lord Vishnu in all its Glory. The first one describes Him gloriously seated on the shores of the Milky Ocean. The second describes Him in his Cosmic Form or the VishwaRoopam. The third, fourth and fifth Dhyana Shlokas describe the various aspects of His divine personality. 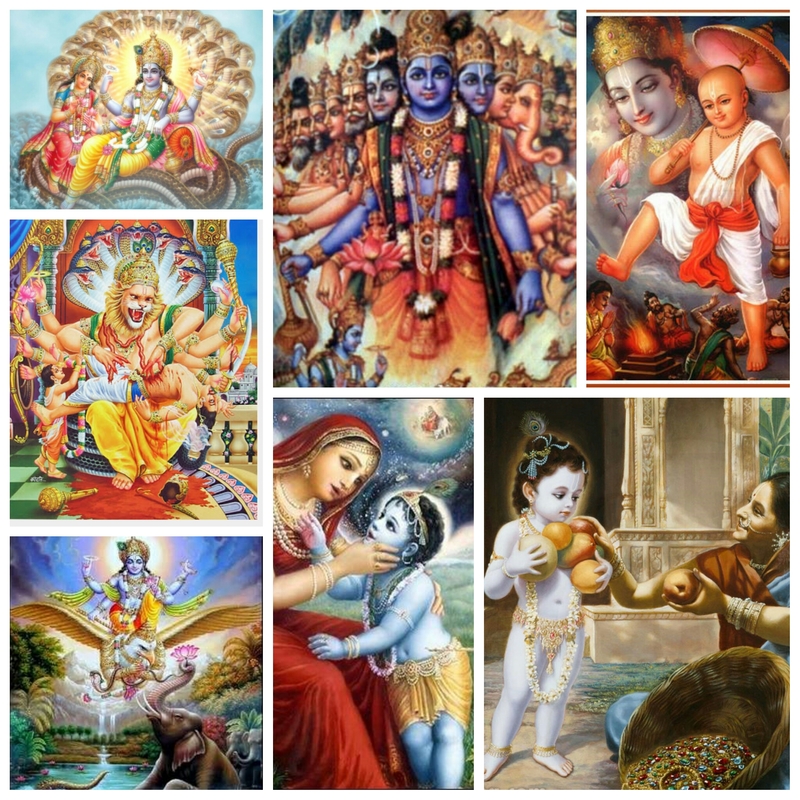 The sixth and seventh ones are specific to His incarnation as Krishna. In the next few sections we will examine each of the Dhyana Shlokas in greater detail to understand their meaning. The benefit of this approach is that knowing the meaning will help us to visualise the form and help us to concentrate better to achieve the mental calm that is required to fully absorb the spiritual vibrations from the recitation of the Vishnu Sahasranamam. Is it right to chant VSN as Nitya Parayanam without doing sankalpa. Well, I wish to learn it first by heart first ; then go for Kamya Parayanam. Being a devotee of Lord Badrinath ji or Badri Narayana ji ; I wish to chant his name , glory without restrictions of time, space ! Hari Om! 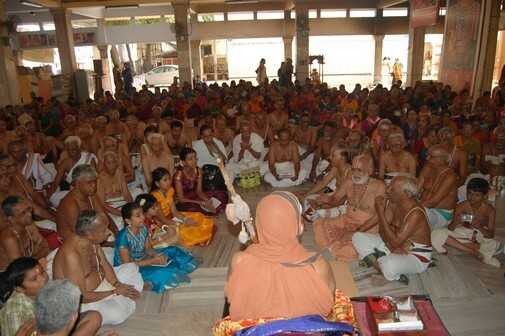 Nitya Parayanama can be done without any Sankalpam. If Sankalpam is in the way of a wish then it is Kamya Karma, one that is done with a desire or with an expectation. Leave it to the Lord to give you the best as He knows what to give to whom and when. Just perform with full faith and devotions and He will bestow His Grace. There is nothing more superior to that (NishKaama Karma). You can chant any of Lord’s thousands and Namas. The Nara Narayana Avataar happened in Badrikashram which is a very sacred place. God bless you! Om Namo Narayana!!! I listen to Vishnu Sahasranamam on youtube by Subhalaxmi after having shower, brushing my teeth, lighting a ghee lamp and sit with folded legs in front of temple at home. Initially i used to just close my eyes and listen to it but my mind keeps having different thoughts, sometimes bad/dirty thoughts so I started to took print of Vishnu Sahasranamam in sanskrit and read it along while it is playing on youtube. I try to concentrate but still sometimes i get bad thoughts in my mind, i try to shut it off but my mind keeps having different thoughts. I can control it for few minutes but then goes back to same (its like chanchal mind who has continuous flow of thoughts). Can you please let me know if listening on youtube and reading in sanskrit as the recitation goes along sitting in front of temple at home, ideal way to do it? At times concentration is very good and i literally get tears in my eyes and at times I can’t concentrate. What is the difference between Vishnu Sahasranamam and Vishnu Namavali? Which is better? ANy help to remove thoughts will be welcome to help me concentrate. Thank you! First and foremost is to not resist the flow of thoughts as the more you try to control, the greater is the force of flow. Just let it flow and become an observer of your thoughts. Over time, constant smaranam of Lord’s Namas will cleanse your mind and thoughts. Regular meditation can also help in improving the focus but let the thoughts appear and flow. Any attempt to resist it will not be effective. Both Sri Vishnu Sahasranamam and Sri Vishnu Namavali have the same effect. You can chant whichever one appeals to you. SAHASRANAMA SHOULD BE RECITED WITH FULL MEANING .IS IS NOT ? I DO NOT KNOW THE MEANING. IS IT USEFUL FOR ME? Dear Sukumar ji! Reciting Bhagavan Nama is a divine action and is full of benefits even if you do not fully understand its meaning. There is a saying that Rama Nama is more powerful than Rama Himself (Ram se Bada Ram ka Naam). Of course, if you understand the meaning the bhava or the emotion in your recitation would be much more powerful. Keep carrying on with your recitation and when the time comes you will be blessed with its meanings too! God bless you! Hari OM! Should I have to read only Dhyan shokas and 107 shlokas only or should I have to read Phalshruti as well for complete session. Hari Om! Chanting the Dhyana Shloka leads forming the mental image of Bhagavan and then chanting the 1000 Namas in His glory results in several benefits. The Phala Shruti confirms the benefits of reciting the Vishnu Sahasranamam and you can skip it if you wish to. I am very grateful to you sir.It gives me real peace of mind.i keep reading all the episodes over and over again. Hari Om! Thank you so much! God bless you! Thank you ji 🙂 God bless you! Hari Om! sir, could you please elaborate how to perform Kamya pranayam for studies. the book suggested is in Tamil . I would be very thankful to you . Any Kaamya parayanam starts with a Sankalpam and you have to chant the mantras as is prescribed. Kamya Parayanam has got a number of procedural restrictions. It has to be performed at a specific time either in the morning after bath or in the evening. It has to be performed for a specific number of days say 48, 24 or 12 days. Each day’s recitation should be done like a Pooja with the picture or idol of Vishnu in the front and be completed with Naivedyam and Aarati. I would advise you to consult a local priest who can guide you appropriately. Daily recitation or smaranam of Sri Vishnu Sahasranamam is, in my view, more than enough to obtain all the goodness. Thank you. Keep your unflinching faith! He will give you the best you deserve! May God bless you! Hari Om! This is very informative and wonderful read – Thanks Sridhar Ji. Please add navigation for the next and previous parts. GREATTTT………had a memorable time reading and learning from this…….TOOOOOOO GUDDD…….AND EASY TO UNDERSTAND AND INFORMATIVE………..!!!!!!!!……….BINGO……!!!!!! !